This is working out to be a part two to the post I put up last week about how we could've had a different history, college and town if Evergreen had been built closer to town. Barring Dr. Emmett Brown, how can we try to solve the separation issue that impacts both Evergreen (as a mostly car based campus) and Olympia (a college town without a college in town). I think the solution would be to cut down some trees! How very non-Evergreen, but they had to cut down trees in the first place, so why not just cut some more. On the east side of campus, there is a large Douglas Fir woods. 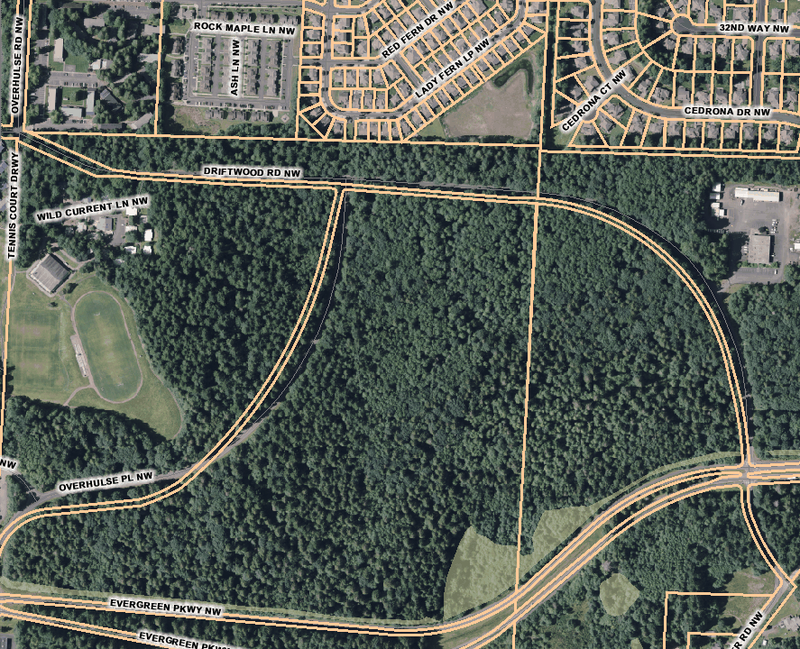 This property is totally owned by the college, is bound on the north by a fairly new residential development, on the south by Evergreen Parkway and on the west, by the non-teaching portion of campus (residential and recreation areas). I can easily imagine a dense residential and commercial development along Driftwood and Olverhulse, hugging the corner between the residential developments and campus. This would encourage more living close to campus and, of course, build a college-town sort of community nearby. And, since I'm just spit-balling here, I am imagining the same sort of mixed density, apartment above commercial development that was sketched out early on in my own neighborhood. Evergreen's own Master Plan admits that too many students commute to campus, and the vast majority of those drive. The same plan mentions vaguely a small "local retail" development as part of a minor addition to campus (Project K). That wouldn't be a bad start, but the idea in the plan is really tiny compared to what sort of real estate is actually available out there.